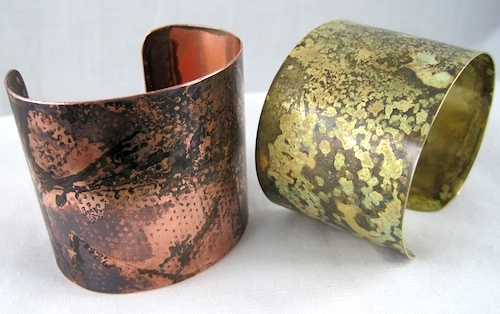 I am so pleased to have received Rena Klingenberg's permission to show you these amazing cuff bracelets that she fabricated from simple sheet metal. Rena adds her ammonia patina finish in a slightly different way than I do it, so I really wanted you to see her method as well! Tell me that you don't want to make some of these! Thanks so much for featuring my project, and for your lovely words about it!